- Size: from 8" to 32"
We offer Bleached Color Hair. These are available in various textures and are processed by using latest technology. These are 100 % natural and conform to various international standards. We customize our white hair so that they could match with our client specifications. Being a leading enterprise of this industry, we are offering a huge range of Bleached Hair. 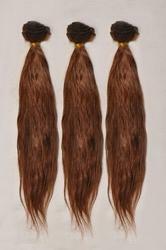 We are committed to manufacture and export a quality range of qualitative Bleached Human Hair. We offer our clients with a qualitative range of Bleached Hair. Our personnel treat natural hair with superior quality hair bleach that oxidizes the melanin in the hair to a colorless compound and prepares it to be colored with different shades. This bleach also oxidizes other components in the hair and stabilizes the structure by oxidative cross-linking to form Di-Sulfides (-SS-). Our organization is offering Bleached Hair to our clients. Our hair is widely admired in the market for its features such as softness, everlasting shine and shed free nature. Our Bleached Hair complies with the prevailing fashion standards and is also offered in customized specifications. We are a trusted name engaged in offering Bleached Hair. In compliance with the requirements of our clients, we offer this hair in varied sizes and lengths.Our Bleached Hair look very trendy and modern. Offered range is known for attributes such as smooth finish and natural look. We are counted amongst the recognized name among AAA Grade Suppliers From India. Our entire variety of product are manufactured from 100% human hair. We believe in quality and we avoid using synthetic or any sort of artificial elements in processing. We are very punctual regarding the deliveries of the products so as to ensure the our respected clients with on time delivery in future too. - Available in 22 custom colors. - Tangle free and shedding free. Hair Material: Pure 100% Virgin Remy Hair. Hair source: We are getting hair from South Indian temples. Hair Grade: 100% First quality AAAAA Virgin Remy Hair. 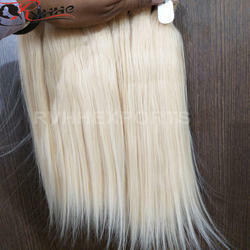 Product Type: Bleached Remy Single Drawn Machine Weft and Bulk Hair. Texture: Available in Straight, Wavy and Curly. Our company has achieved widespread recognition in providing Bleached Hair.